Here in Rome, we are approaching the midpoint of the Synod on Young People, the Faith, and Vocational Discernment, and we are preparing for a special moment in the Church’s life — the canonizations of seven men and women by Pope Francis on October 14. Even as I write, they are preparing to hang the large tapestries bearing the images of our new saints on the facade of St. Peter’s Basilica. It is a beautiful reminder that holiness in the Church wears many faces. The saints show us that the purpose of our lives is to be saints — and this is true for every one of us. Our new saints reflect the diversity of roles in the Church — there is a young layperson, two women religious, two priests, a bishop and a pope. And the stories of these new saints show us how exciting it is to give your life to Jesus Christ and the mission of his Church. 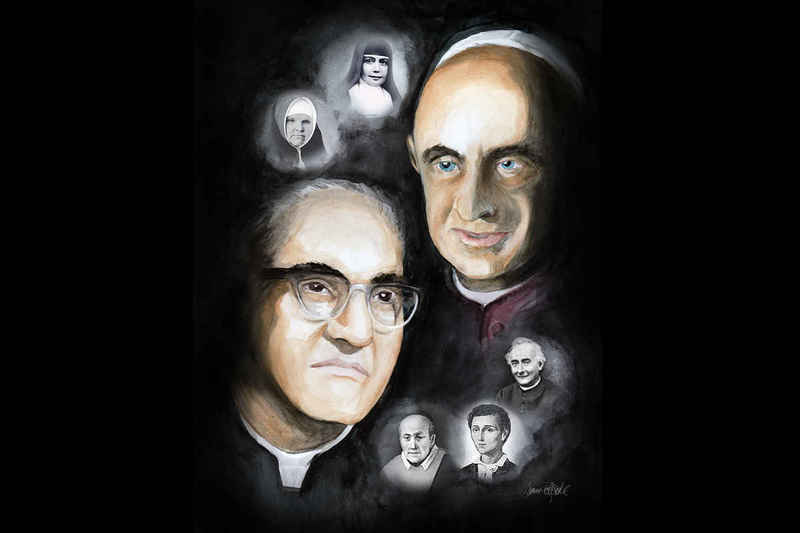 Of course, the most well-known are St. Pope Paul VI and St. Archbishop Oscar Romero. Paul VI was the pope of Vatican II, who called the Church to proclaim holiness and salvation to the modern world and to rediscover the beauty and ethics of human love. Archbishop Romero was a heroic defender of the poor and a martyr for the faith. I am looking forward to celebrating his canonization with hundreds of Salvadoran pilgrims from Los Angeles this week. The others being canonized, while not “household names,” followed the call of Christ and led fascinating lives, overcoming personal setbacks and sufferings in order to spread God’s kingdom in their time and place. Our new St. Maria Catherine Kasper lost her father when she was 21 and was forced to work as a farmhand to support her family. Inspired by the Blessed Virgin Mary’s self-offering to God, she founded the Poor Handmaids of Jesus Christ, which continues to serve the poor in India, Brazil, Mexico, and in parts of Africa, Europe, and the United States. The new St. Nunzio Sulprizio was orphaned at a young age, abused by a stepfather and later an uncle who took him in when his mother died. He died at 19, enduring a long and painful struggle with bone cancer, including having his leg amputated. Throughout a short lifetime of sufferings, he was known for his cheerfulness and patience, offering everything to God and trying to bring others to know Jesus. Our new St. Nazaria Ignacia March Mess lived in Mexico and founded a religious order to spread what she called “a crusade of love” throughout South America. “Loving, obeying and cooperating with the Church in its work of preaching the Gospel to every creature. That is our life, that is who we are,” she said. That is a beautiful description of what all of us should be striving for. This is our life, this is who we are made to be. But what we see in the lives of our new saints is that much of the “stuff” of holiness is ordinary. It does not make for dramatic stories. Often the saints live in silence, known only to the people in their families and immediate communities. One “constant” we find in the stories of our new saints is that they were raised to take their Catholic faith seriously, that they had a strong personal relationship with Jesus and believed in the power of the sacraments, especially the Eucharist. It is a beautiful privilege to be able to spend these weeks in Rome praying and reflecting in the presence of the Vicar of Christ and the successors of his apostles. As I think about the words and experiences of the bishops gathered here from around the world, I am more and more convinced that we need to understand our work in the Church as the work of making saints. And also, I think we need to pay special attention to supporting those young people who are already trying hard to live their faith in Jesus Christ and those families who are already trying hard to raise and form their children in the faith. Holiness is the quiet work of a lifetime and it begins when we are young. So we need to be there to accompany our young people and our families in this precious work of making saints. Pray for me this week and I will be praying for you from Rome. And let us continue to join our Holy Father Pope Francis in making this month of October a time of prayer for the Church. And may Our Lady, Mother of the Church, continue to intercede for the Holy Father and the bishops gathered here for the synod.